Last weekend I wrote about the Ethiopian coffee that I enjoyed at Arts on Main. That post set off a series of fortuitous events, which ultimately led to my attending an Ethiopian cultural walk in downtown Joburg today. I love Ethiopian food and coffee, and I’d heard rumblings of a place deep in Joburg’s city center where Ethiopian culinary delights can be found. It’s not an easy place to reach. I rode downtown with my intrepid new friend Jeroen, who maneuvered gridlocked streets teaming with pedestrians and minibus taxis. Through sheer determination and some luck, we pulled into the parking garage of the (now closed) Johannesburg Sun Hotel and found Ishvara Dhyan, our tour guide, in front of the London Pie Company on the crowded street above. The former Joburg Sun Hotel. One of the other women on the tour said she spent her wedding night there 23 years ago. Believe it or not, the hotel closed more than a decade ago and has been vacant ever since. Ishvara has lived in the Joburg city center all his life and traveled all over Africa and the world. 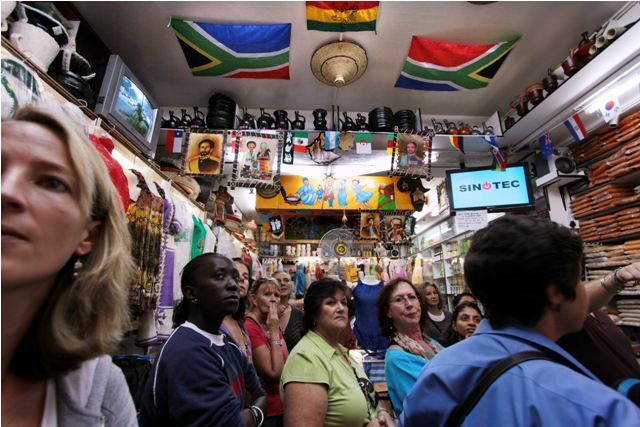 His tours are popular with locals because: 1) They’re cheap at R50 (about $7) per person; and 2) You can experience parts of the city that most people aren’t brave or knowledgeable enough to visit alone. Ishvara herded together our group of about 30 and gave a fascinating account of Ethiopian life in Joburg. 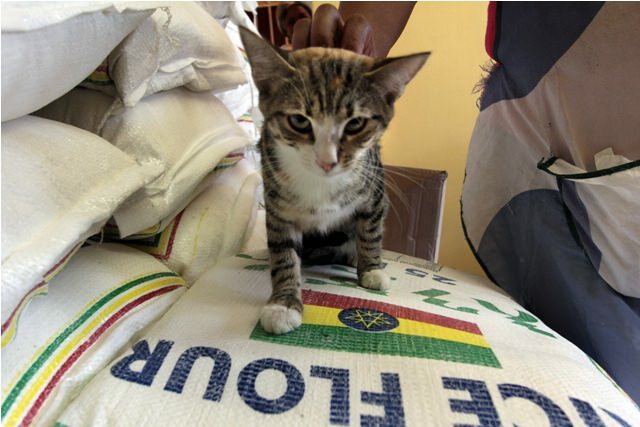 Ethiopians have been migrating here since the mid-1990s and have gradually established dozens of shops, restaurants, and businesses in the buildings in this section of town. Our rag-tag tour group and its leader. Everyone looks a bit unnerved, perhaps because our lesson had been crashed by a very aggressive and stoned drag queen (unseen). 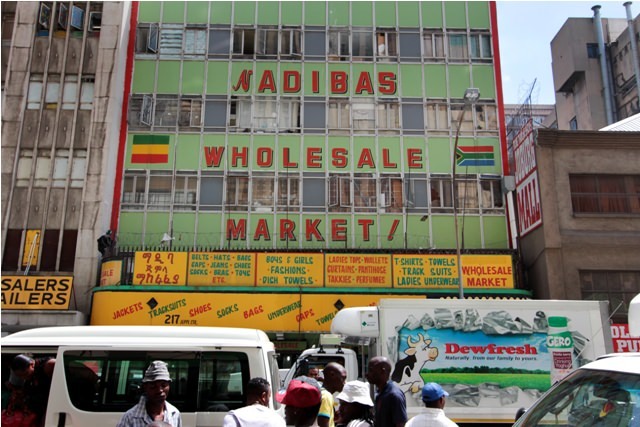 Anyway, the art deco buildings in the background are filled with Ethiopian shops. 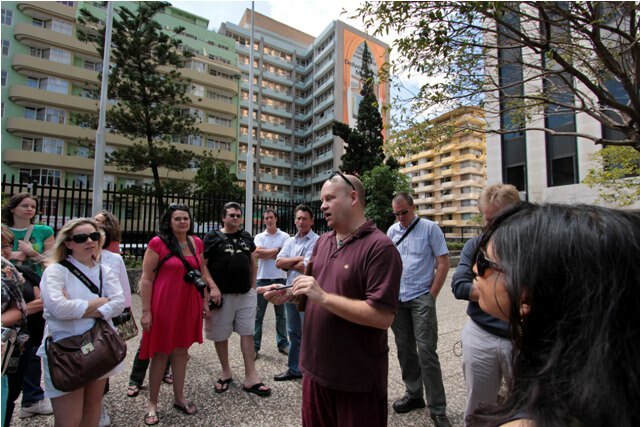 We spent the majority of the tour in the green building on the left, which used to be called the Medical Arts Building but is now the Haile Selassie Building. 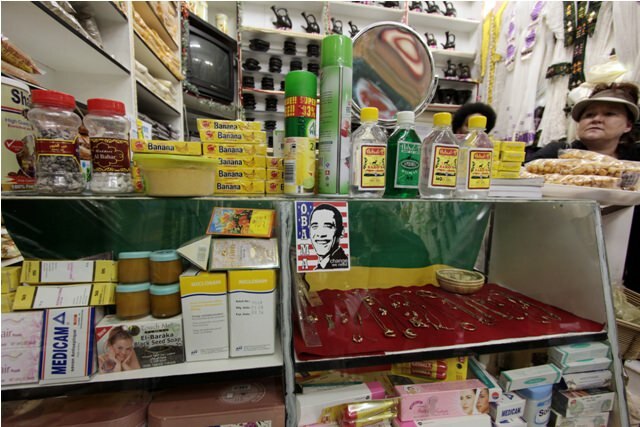 I was interested to learn that these Ethiopian shops cater to the growing number of local Rastafarians, who worship the late Ethiopian Emperor Haile Selassie. 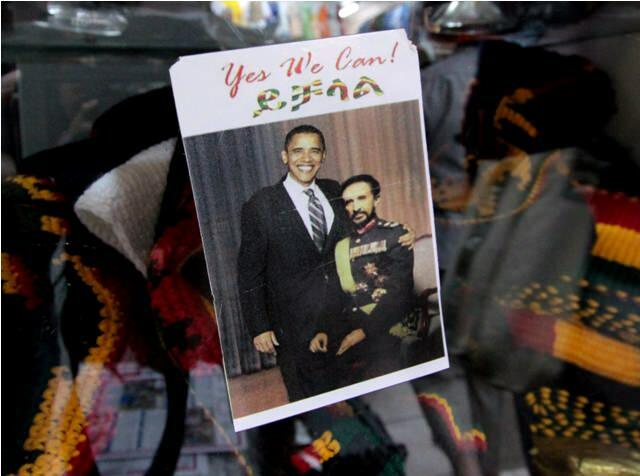 Being shrewd business people, Ethiopians sell Bob Marley kitsch and all kinds of Rasta paraphernalia to Rastafarians. The Ethiopians themselves, however, have no interest in Rastafarianism. We learned many other interesting things about Ethiopian culture but this is the part of the lesson that stayed with me. It was time to go in. View of the street just before we entered the Haile Selassie/Medical Arts Building. The foyer of the building. 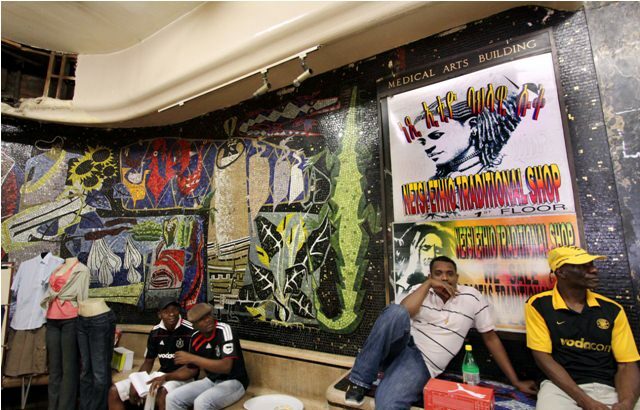 The Medical Arts Building directory has been replaced by posters advertising a traditional Ethiopian shop and Bob Marley. We went up to the second floor, where we were taken into this flagship shop. This is what most of the shops looked like (minus the confused-looking tourists) – colorful cotton dresses on one side, spices and coffee beans on the other, and everything crammed in between. There was also a small space in the back where guests could participate in a coffee ceremony like the one we saw at Arts on Main. But I wasn’t in the mood for coffee and it was a bit difficult to squeeze back there anyway. 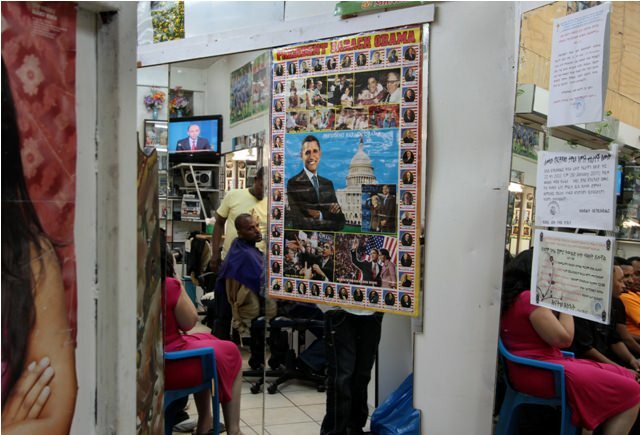 My president is still popular among the Ethiopians! Along with air freshener, banana gum, gold jewelry, and gin. Posted outside a barber shop. The tour concluded with a buffet lunch. 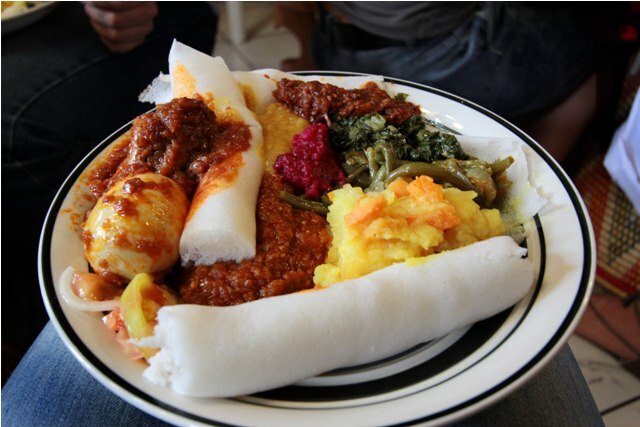 This isn’t normally the way Ethiopian food is served – it should be on a huge round platter that feeds four, covered in rolled-out pieces of injera (the spongy bread) and topped with small portions of each of the different dishes. But there weren’t enough big platters so I had my own plate to stuff my face with. I don’t know the names of anything but it was all delicious. No utensils allowed. This city is starting to exhaust me. My blog can hardly keep up. Hmmm …Ethiopian food. Injera …uggghhhh. Good article though. Keep up the good work. Oh man, I could stuff myself full of injera. In fact I just did. Anyway, thanks for reading. The food looks delicious! I am planning on hopefully bringing the family to SA for a visit sometime before our son graduates from HS (4 more years). You are quickly giving me all kinds of stuff to do and see in Johannesburg! Thanks! Have a great day! Thanks so much. Come on over! Thanks a lot. The more you look, the more you find. I love, love, LOVE this blog. You have given me some seriously great incentive to be adventurous in a couple of weeks when I journey to Africa for the first time. I’ll be in Jo’burg for a few days and was starting to lose hope that I could do anything on foot until I stumbled across your blog. That’s really great to hear. There’s really a ton to do here — I’ve barely scratched the surface. Where else are you going in Africa? Oh, wow! We passed through Bulembu a few months ago. There’s a pic here: http://bit.ly/eFfGTO. We didn’t stop there but I’ve heard there are some cool things to do. Enjoy! Swaziland is a beautiful country. Driving in Joburg requires both luck and serious skills. I was fortunate to ride with someone who has both. Thanks again, it was really fun. I was also on the tour, thanks for the great pics and the commentary. This would be my kind of place to spend an afternoon, and the food look sooo good. I can’t believe the Sun closed. Do you know why? We once had dinner there; we were invited to an airline convention and it was so larney. I think it closed just because of crime and the general deterioration of the CBD. Sad. Hopefully someone will take a chance on it soon. The Johannesburg Sun opened in 1985, one of the last glass skyscrapers to go up in the city. The main tower is around 40 floors, but the old Tolman Towers next to it (20 floors) was renovated as well, and was part of the hotel. With 500+ rooms, it was the largest hotel in the Southern Hemisphere at the time. During the 1990’s the area went into decline. As Joubert Park became a criminal haven, the Landrost and other 5stars closed. The Marriston became a residential hotel (it is actually still in pretty good shape today). In 1990 the 5star hotel downgraded, and effectively became a 1star (the downtown holiday inn). In 1996 it closed. The 5star Carlton followed in 1998, after failing to get a casino license. The area was so unsafe that airline crews could not walk out the doors without fear of being attacked. 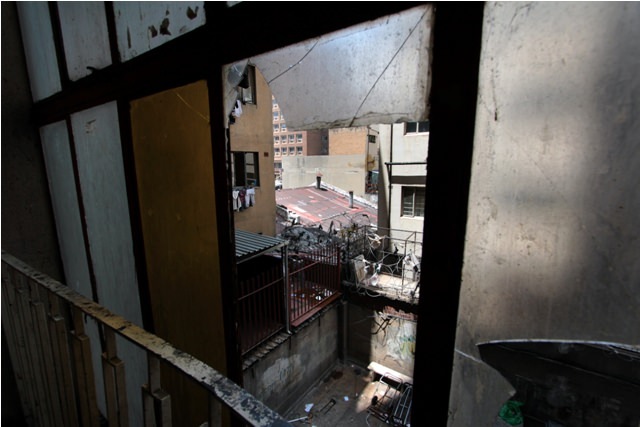 Today the area around it is a lot safer, but with Sandton hotels it is unlikely that these huge hotels will open again. We forget that tens of 5stars popped up in the North, 30 years ago this was one of the only big hotels in the city. Cities change, there are casualties. And this particular tower will be very difficult to redevelop, as it will not really suit a residential conversion. Sad, but inevitable. I really enjoy your posts on Joburg. It looks like such a different city to the one I knew in my high school days. Really multicultural and far from the drab mining city I used to know. Great photos and prose. The hotel photos is fab! btw arrived here via Cathy’s A sketch in time. Hey it was great to see two of our intrepid Joburg Photowalkers, Jacqueline (red dress) and Mark (black T and brown shorts) in your photo where Jeroen is obscured by the Indian lady to the right of Ishvara. Ha! The world is getting smaller and smaller. 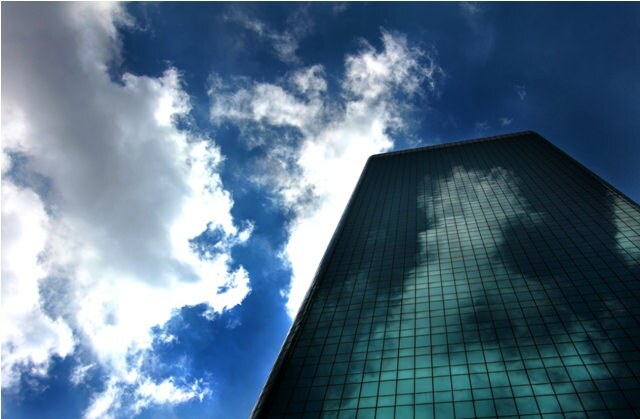 Love your photos and the details – a great companion piece. Where are we going next? That has to be the worst looking injera I have EVER seen! Injera should NEVER be that white! Oh no! I enjoyed it nonetheless. It’s possible that my white balance settings were off and it appears whiter in the photo than it actually was. Hi. great blog! Do you have a contact for Ishvara Dhyan? I would love to do the tour. Hey there, glad you liked the post! Here is Ishvara’s page on Facebook. Looks like he has a tour of Fordsburg coming up this weekend.